RCM is a differential pressure direct reading flow meter. 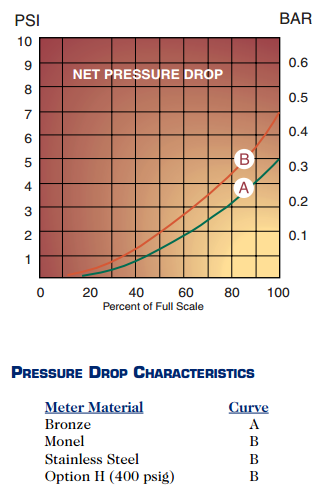 The Flo-Gage measures flow based on a pressure differential created across a built-in calibrated nozzle. The meter is self contained and complete. It does not require external power connections, separate orifices, or blocking, purging or equalizing valves. It is suitable for monitoring all liquids and gases that have low or medium viscosity, low solids content, and are compatible with the materials of construction. The meter features rugged, compact construction. In liquid applications of 6 GPM and higher, pulsation snubbers are incorporated into the connecting pressure passages to produce smooth meter operation independent of pipeline turbulence. This meter was developed for industrial flow metering applications in which durability and reliability are important considerations. Accuracy, small size, low cost, minimal maintenance and resistance to accidental damage are the prime goals in the RCM design. Typical applications include: lube oil and cooling water monitoring, blending processes, reverse osmosis systems, and compressed air measurement. The RCM is available with a 4­20 mA output for interfacing with remote displays and controllers. Limit switches are available to provide high and low limit signals. A 0­1000 Hz frequency output is available to drive frequency based controllers and counters. Accuracy: ± 3% Full Scale Repeatability: ±1% F.S. A). Body Size: pipe at the meter inlet. Select from standard flow rates and body sizes. B). Series (Mounting Method): 7 = threaded units provided with FNPT connections standard. 8 = wafer units mount between any standard 150 or 300 class flanges (or international equivalent). D). 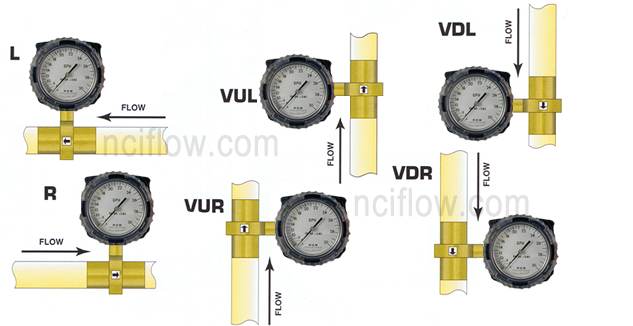 Flow Direction: Select L, R, VUL, VUR, VDL, VDR (see diagram below). E). Flow Rate (full scale): Select from Standard Flow Rates and Body Sizes. F). Options (if required): Select from table of Options. G). Switches (if required): 1S2 = One single pole double throw switch or 2S2 = Two single pole double throw switches.